Do you collect anything? I absolutely love the process of collecting, and the enjoyment I get from the memories connected to these cherished objects: some were gifts (to me by friends and family or from myself to my husband), some were purchased while travelling on family trips or vacations, and some were acquired while in the company of a loved one. Each of them tells a story. Hello friends. Welcome back to Kristine Robinson’s Interiors. In honor of the new year, which is often depicted with clocks to represent the passing of time, I thought I’d share with you my own cherished collection of vintage and antique time-pieces. My husband and I have been collecting antique clocks since we were first dating, over 25 years ago. Inspired by the movie of H.G. Wells’ The Time Machine, in which the main character’s study is filled with a variety of clocks, we began our journey of acquiring our own vintage examples. 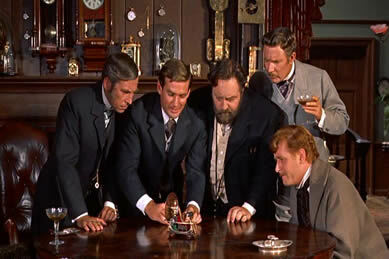 The 1960 movie, The Time Machine by H.G. Wells, was an inspiration to begin collecting antique clocks. This image from the beginning of the film shows the main character’s study which has walls covered in all manner of clocks. Today our collection includes some beautiful examples and I thought I’d share just a few of my favorites with you today. Many of our clocks are displayed in our living room bookshelves, alongside antique and vintage books I’ve been collecting since High School. 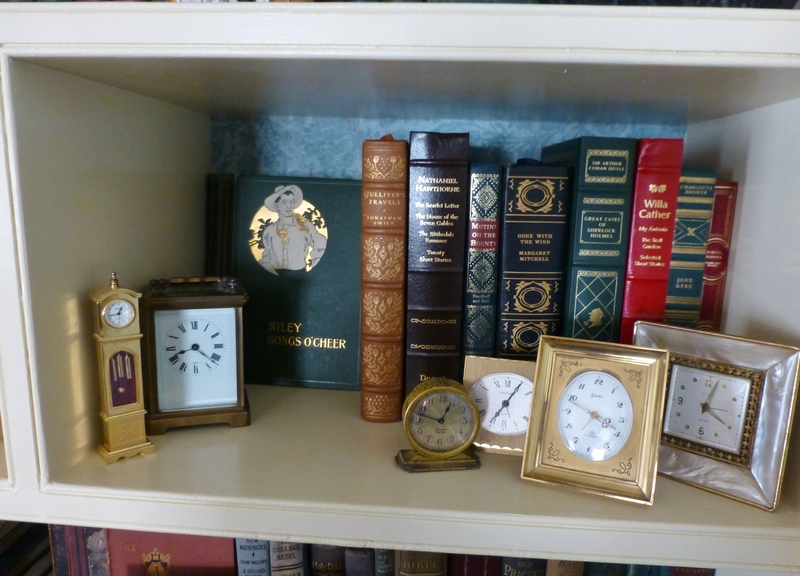 Here you see a grouping of small tabletop clocks, amongst some leather bound books. 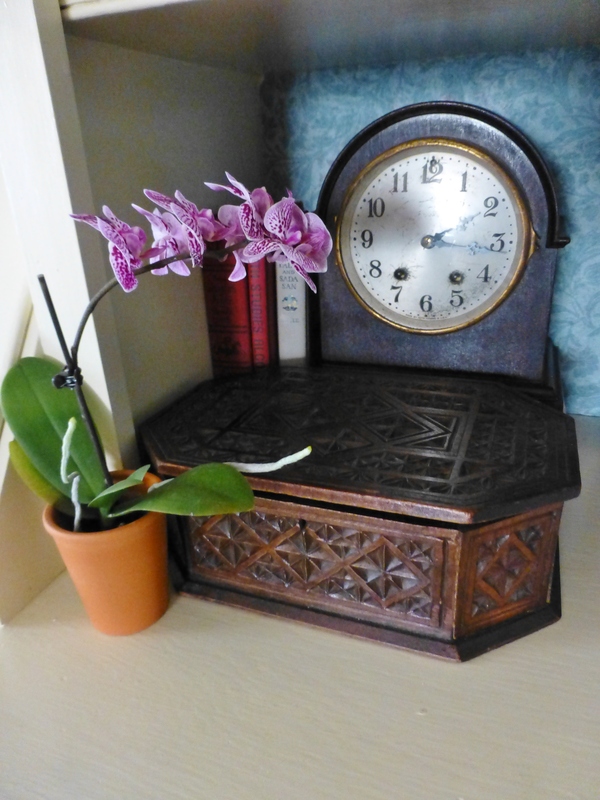 This small wooden dome clock is tucked back in a corner, behind a lovely antique chip-carved box. 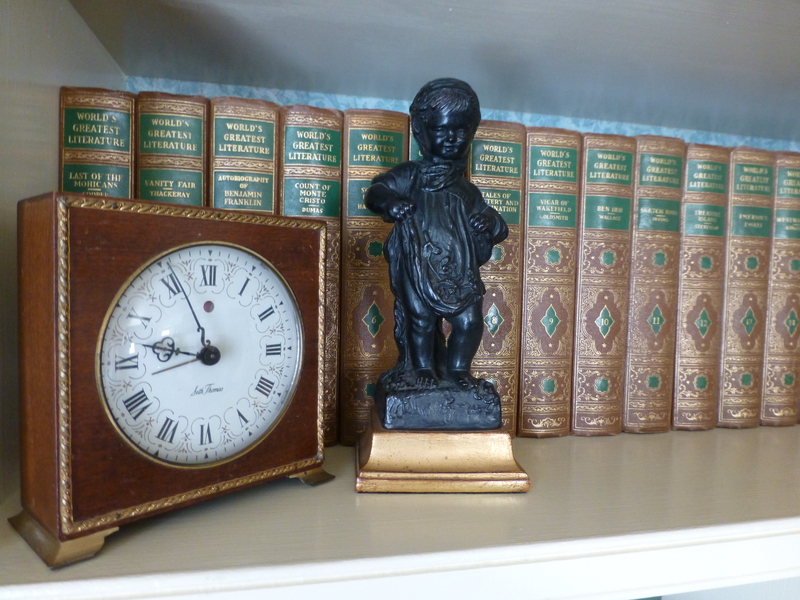 A vintage wood example (probably from the 1940’s) looks pretty when paired with a Borghese figurine and placed in front of a large set of ‘The World’s Greatest Literature’. The gold details tie all the elements together. 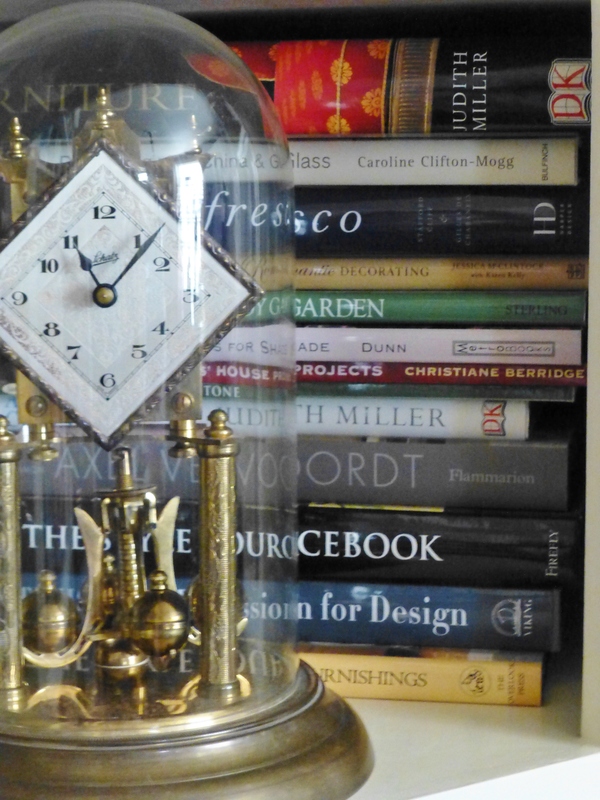 This glass-domed anniversary clock resides in front of my vast collection of interior design books. 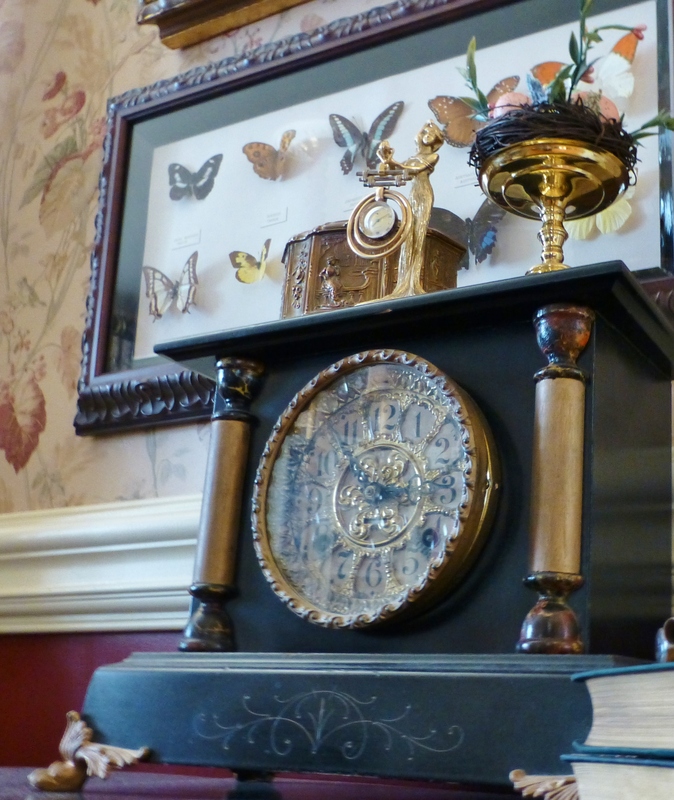 A bronze, gilded clock by Jennings Brothers occupies a spot with some cherished antique books and accessories. This one is a favorite–I adore the faded gilt patina with bronze peeking through, and the sculpted Dogwood flowers which embellish the entire piece. 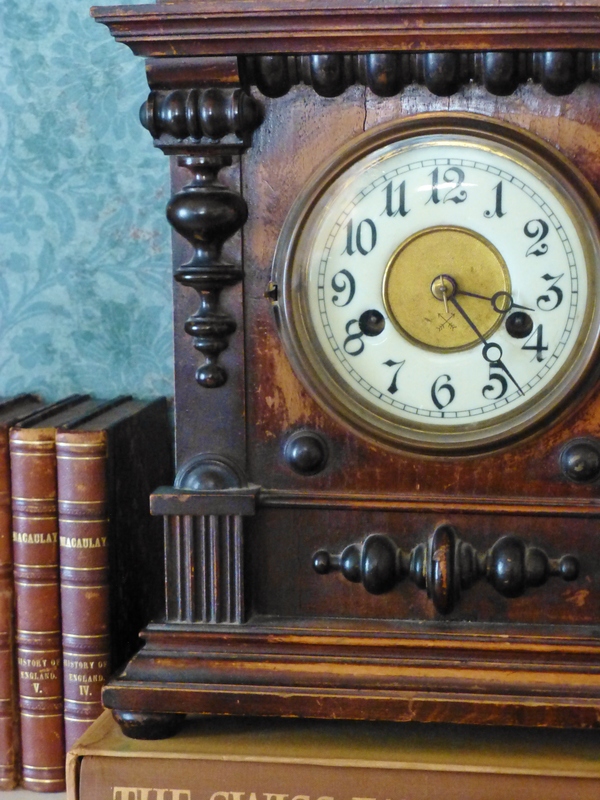 This detailed antique German clock was a gift to my husband for one of our wedding anniversaries many years ago. I love the patina and texture it has on the turnings and around the face. You can tell that it has been loved for many years. The porcelain face is beautiful too, don’t you think? 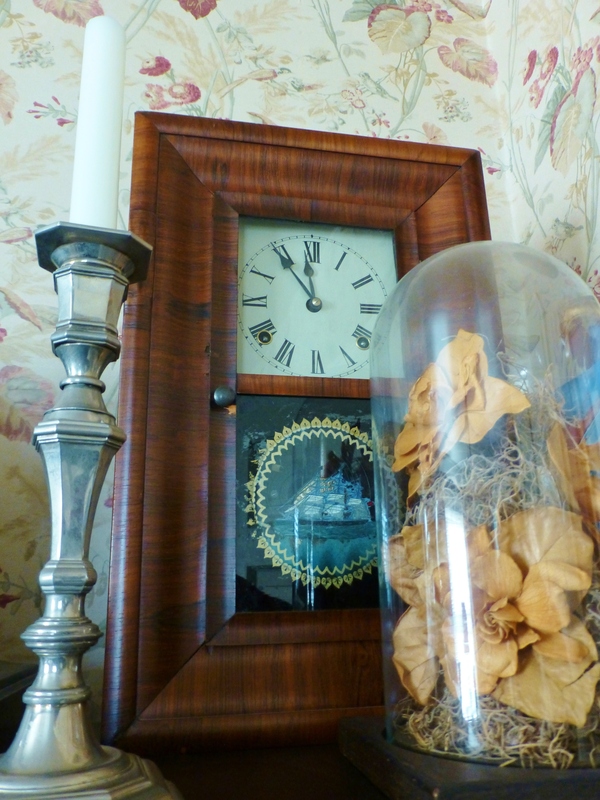 This turn-of-the-century slate ‘black clock’ is in our dining room, where an Art Deco pocket watch is displayed on top. The framed butterflies were a gift from a dear friend and were collected from all over the world. 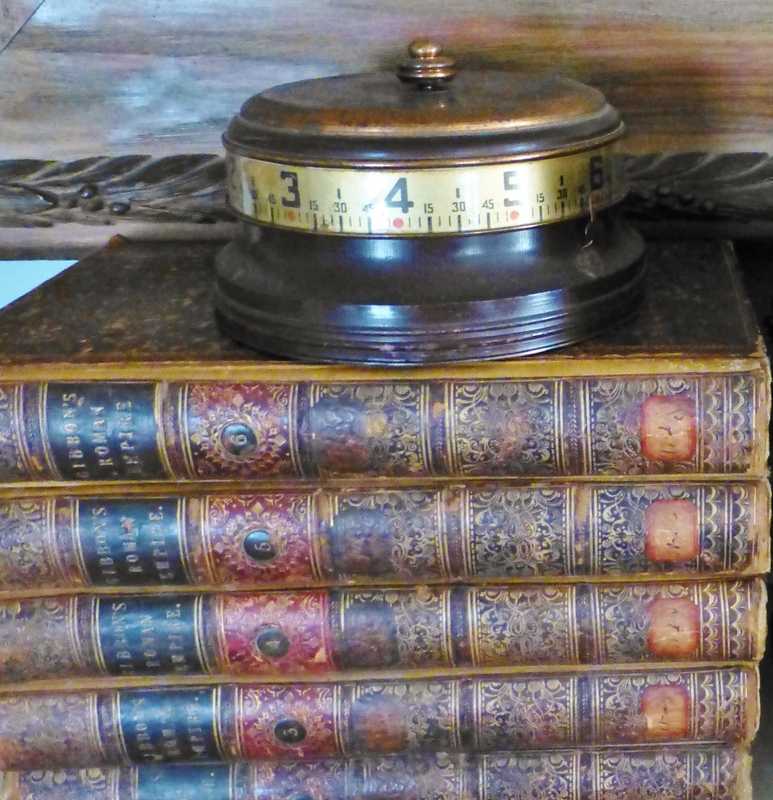 An unusual desk clock sits atop a stack of leather-bound books on our fireplace mantel. We bought this one on an outing to the antiques market, just this year. Made of metal, the numbered band rotates and a little indicator (barely visible just under the 6 at the right) points to the current time. This ‘camel back’ mantel clock was a wedding gift from myself to my husband. I purchased it at an estate auction just before we were married. It has lovely Westminster chimes which ring every quarter hour. A ‘shelf clock’ with a reverse painted glass was a gift from my wonderful parents. The cloche holds dried gardenias from my own wedding bouquet. 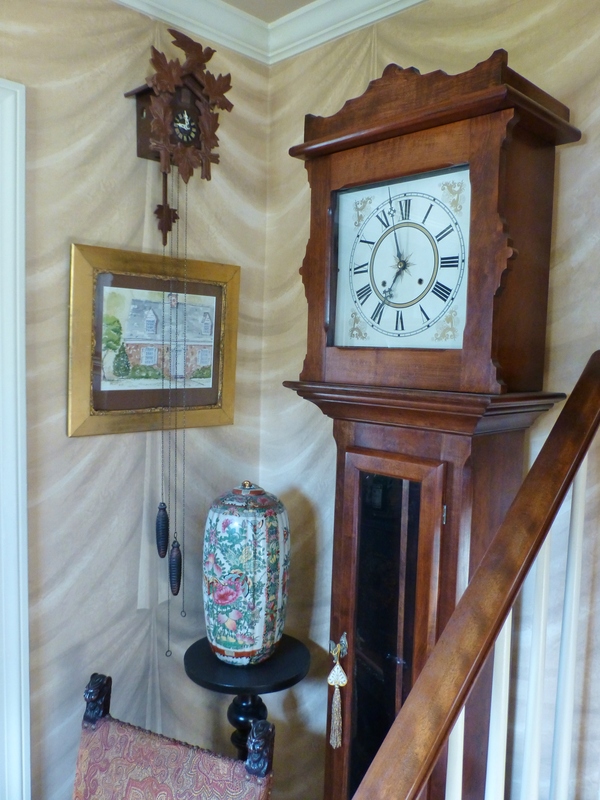 Here is the grandfather clock my husband refinished and restored many years ago. It stands in our foyer where it greets guests, along with a cuckoo clock and a watercolor (painted by my uncle) of our little cottage. So those are some of the clocks in our collection. There are more, but these are my favorites. Do you collect anything? I absolutely love the process of collecting, and the enjoyment I get from the memories connected to these cherished objects: some were gifts (to me or from me), some were purchased while travelling on family trips or vacations, and some in the company of a loved one. Each of them tells a story. Thanks for coming along today and exploring my collection of antiques and vintage clocks. I truly hope you have a very happy, healthy, and prosperous New Year in 2015! I’ll see you next time! Until then, don’t forget to tell everyone you know about Kristine Robinson’s Interiors…I need all the friends I can get! 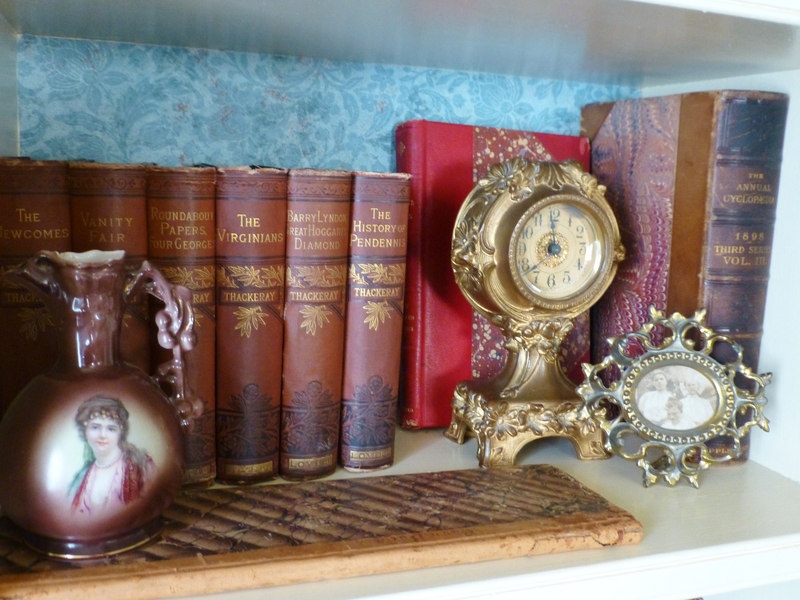 This entry was posted in Antiques, Clocks, Home Decor, Interior Design & Decorating, Robinson Interiors and tagged accessories, Antique Books, Antique Clocks, Books, Bookshelves, Collectibles, Collecting, Decorating, Grandfather clock, Jennings Brothers, Kristine Robinson, Vintage. Bookmark the permalink. Loved seeing this. I’m also a big fan of clocks and without even realizing it I have been collecting them as well. I tend to lean towards art deco and mid century examples. Loved the variety that you have! Thanks, Joseph! 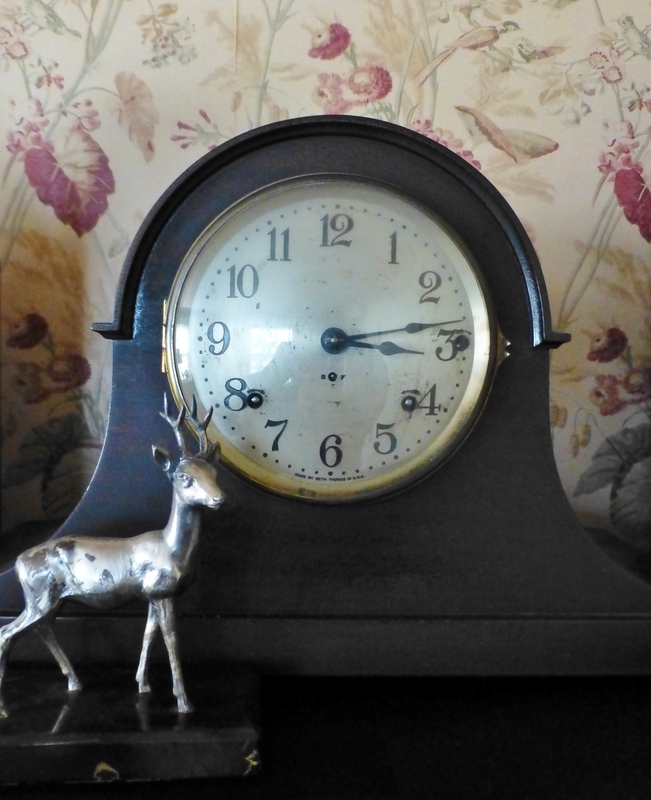 So cool that you collect clocks as well…would love to see your collection sometime! Happy New Year, my friend. I love this blog! You and your husband are so amazing. I think that collected an unique and antique clock are difficult because to found the clock not all place there. Moreover you are collected when you are in senior high school. But now you have the pride of your self because you get collection many of clock on your home.i have to recommended to you the website that collecting an antique and unique clock. You can visit gudemeis.nl . On the website you can looking for many clock. You’re interesting for it? You can click the website for more information and details. Thank you. Thanks Ariana Lisa. I love my old clocks and my other collections too. I have many wonderful memories associated with these pretty things.